You will need Xcode 10 and Vapor 3. In this tutorial we will be creating a new iOS chat app using Chatkit with a Vapor backend that handles creation of our users. We will also implement push notifications using Pusher Beams. 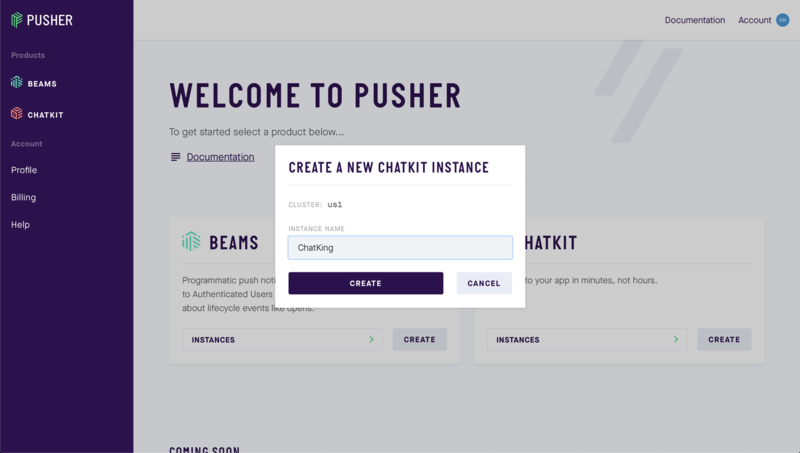 At the time of writing there is no official Chatkit server SDK so we will be interacting directly with the Pusher Chatkit API. “Getting started with Vapor” Part One and Part Two. Xcode 10 and the latest Xcode command line tools. Vapor 3.0 - Install instructions here. An understanding of iOS development and Xcode environment. From a terminal in your working directory enter the following command to create your Vapor application. Now we will build your application before opening it in Xcode. Remember your first build could take some time to complete. Also remember to change the run scheme to be the “run” scheme in case it is not already set to this. // 💧 A server-side Swift web framework. // 🔵 Swift ORM (queries, models, relations, etc) built on SQLite 3. Note: Leave the line swift-tools-version:X.X as it was when you opened the file. We already have our SQLite dependency installed as this comes as default. To configure it we need to make some changes to our configure.swift. /// Called before your application initializes. /// Register the configured SQLite database to the database config. You will also notice that we have added our user migration in here as well ready for creating our model. We need to create a new model for our user. Close Xcode and open terminal at your working directly and enter the following commands to create a new file and reopen Xcode. Note: We have an optional name parameter. This is because the Chatkit API expects a name key in the JSON. We will just be assigning our username to this parameter however you could modify the init methods to handle a name parameter being passed in as well. Here we are creating our user type. We are saying that the ID field for the database is a UUID that we will provide. We will be able to use this UUID to create our user on the Pusher platform as well. We have also provided a constraint on the username field and said that this must be unique. If we try to create a new row in the database with a name that already exists it will fail. We now need to create a new model for our rooms. Close Xcode and open terminal at your working directly and enter the following commands to create a new file and reopen Xcode. The room model is very similar to our User model. Now reopen your configure.swift file and below the line services.register(databases) add the following to configure our migrations. Open your Pusher dashboard or create a free account by following this link, create a new Chatkit instance and name it ChatKing. Once your instance is created go to your credentials tab. Make a note of your instance locator and your secret key you will need them later. You will also need to turn on your test token provider, we will need this for the second part of this tutorial. You will need to make note of your all of these formats. You will need them for interacting with the API endpoints directly. Your test token endpoint has an example of its use. Whilst we are in the dashboard we will also setup push notifications for our iOS application. Switch to the Push Notifications tab. Note: Push Notifications in Chatkit is in beta at the time of writing this tutorial. You will need to upload your signing key and provide your team ID in the APNS integration section. Follow the links provided in the dashboard if you are unsure of where these are. The Chatkit API requires the requests to be signed with a JSON Web Token. We need to create a function that will create this token for us. Fortunately we have installed a package that will help with this, PerfectoCrypto. Let’s create a controller that will handle this, close Xcode and enter the following in terminal. Replace the placeholders with your instance ID, API key and secret key that we made a note of earlier. This function will use the package we installed in order to create a token that we can add as BearerAuthorization in our requests with the API. The token will last for 24 hours from creation and importantly the su key gives admin access. We can also pass in a userId to this method, this allows the Chatkit API to know the user who signed the token. We need to create a new controller for handling of user creation. Close Xcode and open terminal at your working directly and enter the following commands to create a new file and reopen Xcode. This controller conforms to the RouteCollection and defines it’s routes within it. This is instead of using the routes.swift file. Our find method takes a name property and performs a search on the Users in the database. If it finds a user with the matching name it returns it in the response, if it doesn’t it sends a 404 status code. We will use this method to act as our login method. We’re keeping it simple with no password authentication. This method also takes a name property as a parameter and creates a new user. We start by creating our Chatkit end point, you will need to add your instance ID here. We then create a new UUID for our user and then attempt to create and save this user. We can only create the user if the name is unique. If we successfully save the user to our database we then create a JWT token and use this as our authorization token before we post the details of our user to the Chatkit endpoint to create our user. This method takes a name property as a parameter and creates a new room. We start by creating our Chatkit end point, you will need to add your instance ID here. We then check that a user UUID has been passed in. We then check if a user exists with this UUID. Chatkit requires the authorization token to be signed with the ID of the user creating the room. We then create a new UUID for our room and then attempt to create and save this room. We can only create the room if the name is unique. If we successfully save the room to our database we then create a JWT token and use this as our authorization token before we post the details of our user to the Chatkit endpoint to create our user. We use this handler to get all of rooms we have created. This allows us to get all the rooms from our database if we wish rather than talking to Pusher directly. This request allows us to get a individual room. /// Register your application's routes here. Our final route allows us to get an auth token for a user Id from our client. This will allow us to connect to our Chatkit instance as an authenticated user. Notice the token structure defined at the bottom, this is the structure that the Pusher iOS SDK will be expecting in order to authenticate when we hit our auth URL. It means that ngrok has opened up your localhost port 8080 to the internet and provided you with both a HTTP and HTTPS URLs to reach it. In this part of the tutorial we’ve learnt how to create our Vapor server, create and save a unique user and room to the database and also interact with the Pusher API directly. We’ve also setup push notifications in our Pusher dashboard. In the second part of this tutorial we will create the iOS application that interacts with this server and the Pusher Chatkit SDK.